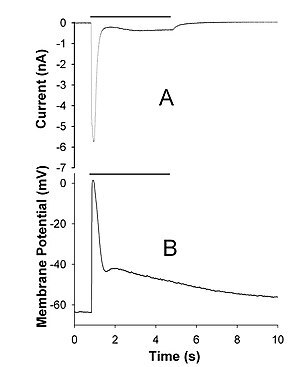 Transient receptor potential channels (TRP channels) are a group of ion channels located mostly on the plasma membrane of numerous animal cell types. There are about 28 TRP channels that share some structural similarity to each other. These are grouped into two broad groups: Group 1 includes TRPC ( "C" for canonical), TRPV ("V" for vanilloid), TRPM ("M" for melastatin), TRPN, and TRPA. In group 2, there are TRPP ("P" for polycystic) and TRPML ("ML" for mucolipin). Many of these channels mediate a variety of sensations like the sensations of pain, hotness, warmth or coldness, different kinds of tastes, pressure, and vision. In the body, some TRP channels are thought to behave like microscopic thermometers and used in animals to sense hot or cold. Some TRP channels are activated by molecules found in spices like garlic (allicin), chilli pepper (capsaicin), wasabi (allyl isothiocyanate); others are activated by menthol, camphor, peppermint, and cooling agents; yet others are activated by molecules found in cannabis (i.e., THC, CBD and CBN) or stevia. Some act as sensors of osmotic pressure, volume, stretch, and vibration. Associated with focal segmental glomerulosclerosis. TRPV1 mediates the pungent odour and pain/hot sensations associated with capsaicin and piperine. Stress (mechanical) receptor. Disputed to be temperature-sensitive; activated by isothiocyanates (pungent chemicals in substances such as mustard oil and wasabi). Associated with hypomagnesemia with secondary hypocalcemia. Associated with polycystic kidney disease. Associated with mucolipidosis type IV. Most TRP channels are composed of 6 membrane-spanning helices with intracellular N- and C-termini. Mammalian TRP channels are activated and regulated by a wide variety of stimuli including many post-transcriptional mechanisms like phosphorylation, G-protein receptor coupling, ligand-gating, and ubiquitination. The receptors are found in almost all cell types and largely localized in the cell membrane, modulating ion entry. TRP channels modulate ion entry driving forces and Ca2+ and Mg2+ transport machinery in the plasma membrane, where most of them are located. TRPs have important interactions with other proteins and often form signaling complexes, the exact pathways of which are unknown. TRP channels were initially discovered in the trp mutant strain of the fruit fly Drosophila  which displayed transient elevation of potential in response to light stimuli and were so named transient receptor potential channels. TRPML channels function as intracellular calcium release channels and thus serve an important role in organelle regulation. Importantly, many of these channels mediate a variety of sensations like the sensations of pain, hotness, warmth or coldness, different kinds of tastes, pressure, and vision. In the body, some TRP channels are thought to behave like microscopic thermometers and are used in animals to sense hot or cold. TRPs act as sensors of osmotic pressure, volume, stretch, and vibration. TRPs have been seen to have complex multidimensional roles in sensory signaling. Many TRPs function as intracellular calcium release channels. TRPM5 is involved in taste signaling of sweet, bitter and umami tastes by modulating the signal pathway in taste receptor cells. The TRP channels play a significant role in taste with channels responding to different tastes. TRPA1 responds to mustard oil (allyl isothiocyanate), wasabi, and cinnamon, TRPA1 and TRPV responds to garlic (allicin), TRPV1 responds to chilli pepper (capsaicin), TRPM8 is activated by menthol, camphor, peppermint, and cooling agents; TRPV2 is activated by molecules (THC, CBD and CBN) found in marijuana; TRPM5 is activated by the sweet glycosides found in the stevia plant. Altered expression of TRP proteins often leads to tumorigenesis, clearly seen in TRPM1 and TRPV6. Particularly high levels of TRPM1 and TRPV6 in prostate cancer and of TRPM1 in melanomas have been noted. Such observations could be helpful in following cancer progression and could lead to the development of drugs over activating ion channels, leading to apoptosis and necrosis. Much research remains to be done as to whether TRP channel mutations lead to cancer progression or whether they are associated mutations. In addition to TLR4 mediated pathways, certain members of the family of the transient receptor potential ion channels recognize LPS. LPS-mediated activation of TRPA1 was shown in mice and Drosophila melanogaster flies. At higher concentrations, LPS activates other members of the sensory TRP channel family as well, such as TRPV1, TRPM3 and to some extent TRPM8 . LPS is recognized by TRPV4 on epithelial cells. TRPV4 activation by LPS was necessary and sufficient to induce nitric oxide production with a bactericidal effect. ^ Cosens DJ, Manning A (October 1969). "Abnormal electroretinogram from a Drosophila mutant". Nature. 224 (5216): 285–7. doi:10.1038/224285a0. PMID 5344615. ^ Philippaert K, Pironet A, Mesuere M, Sones W, Vermeiren L, Kerselaers S, Pinto S, Segal A, Antoine N, Gysemans C, Laureys J, Lemaire K, Gilon P, Cuypers E, Tytgat J, Mathieu C, Schuit F, Rorsman P, Talavera K, Voets T, Vennekens R (March 2017). "Steviol glycosides enhance pancreatic beta-cell function and taste sensation by potentiation of TRPM5 channel activity". Nature Communications. 8: 14733. doi:10.1038/ncomms14733. PMC 5380970  . PMID 28361903. ^ a b Cosens DJ, Manning A (October 1969). "Abnormal electroretinogram from a Drosophila mutant". Nature. 224 (5216): 285–7. doi:10.1038/224285a0. PMID 5344615. ^ Leung HT, Tseng-Crank J, Kim E, Mahapatra C, Shino S, Zhou Y, An L, Doerge RW, Pak WL (June 2008). "DAG lipase activity is necessary for TRP channel regulation in Drosophila photoreceptors". Neuron. 58 (6): 884–96. doi:10.1016/j.neuron.2008.05.001. PMC 2459341  . PMID 18579079. ^ a b Prevarskaya N, Zhang L, Barritt G (August 2007). "TRP channels in cancer". Biochimica et Biophysica Acta. 1772 (8): 937–46. doi:10.1016/j.bbadis.2007.05.006. PMID 17616360. ^ Meseguer V, Alpizar YA, Luis E, Tajada S, Denlinger B, Fajardo O, et al. (20 January 2014). "TRPA1 channels mediate acute neurogenic inflammation and pain produced by bacterial endotoxins". Nature Communications. 5: 3125. doi:10.1038/ncomms4125. PMID 24445575. ^ Soldano A, Alpizar YA, Boonen B, Franco L, López-Requena A, Liu G, Mora N, Yaksi E, Voets T, Vennekens R, Hassan BA, Talavera K (June 2016). "Gustatory-mediated avoidance of bacterial lipopolysaccharides via TRPA1 activation in Drosophila". eLife. 5. doi:10.7554/eLife.13133. PMID 27296646. ^ Alpizar YA, Boonen B, Sanchez A, Jung C, López-Requena A, Naert R, et al. (October 2017). "TRPV4 activation triggers protective responses to bacterial lipopolysaccharides in airway epithelial cells". Nature Communications. 8 (1): 1059. doi:10.1038/s41467-017-01201-3. PMID 29057902. Clapham DE, DeCaen P, Carvacho I, Chaudhuri D, Doerner JF, Julius D, Kahle KT, McKemy D, Oancea E, Sah R, Stotz SC, Tong D, Wu L, Xu H, Nilius B, Owsianik G. "Transient Receptor Potential channels". IUPHAR/BPS Guide to Pharmacology. This family of proteins are transient receptor potential (TRP) ion channels. They are essential for cellular viability and are involved in cell growth and cell wall synthesis . The genes for these proteins are homologous to polycystic kidney disease related ion channel genes . This entry represents a family of transient receptor potential channel-like proteins. The family includes several fungal flavin carrier proteins, which may be responsible for the transport of FAD into the endoplasmatic reticulum lumen, where it is required for oxidative protein folding [PUBMED:16717099]. The family also includes the TRP-like ion channel pkd2, which acts as a key signaling component in the regulation of cell shape and cell wall synthesis through interaction with GTPase Rho1 [PUBMED:15537393].